Today I released my new version of iTraveller. I was working on this version for last 2 weeks, it’s a complete rewrite of old iTraveller, with several added usability features. Now iTraveller can upload photos to Facebook as well. 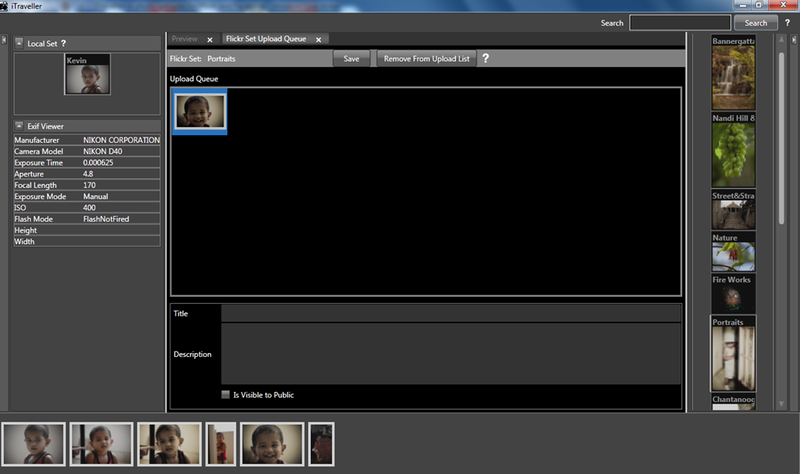 iTraveller is a desktop application to organize your photos and upload them to Flickr and Facebook. iTraveller ease the organizing of photos. 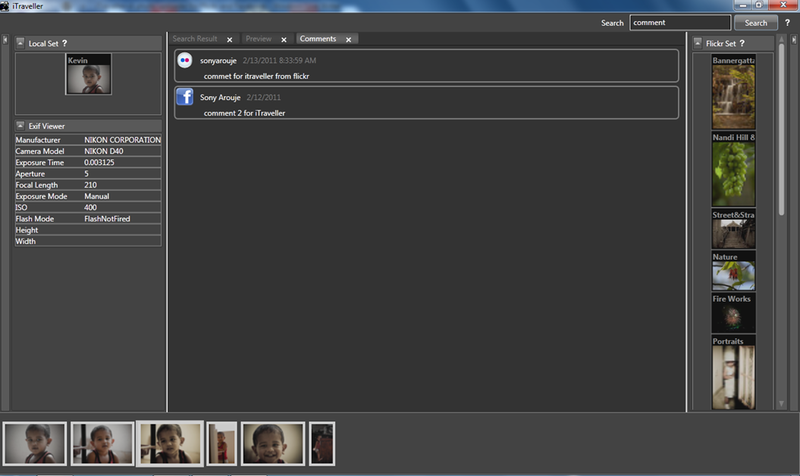 We can mark which photos should go to Flickr or Facebook and add to appropriate set/album in offline. Once you decide to upload, click the Synchronize button leave the rest to iTraveller. While iTraveller synching with Flickr/Facebook, you go for a walk or grab a cup of coffee or you can continue creating your local category or adding more photos to Flickr Set/Facebook Album. Another useful feature of iTraveller is, you can see the photo comments posted by other users in offline mode. I used Calburn micro to separate my View and View Model. Also I extensively used Async CTP to make a very responsive UI. I will give more details of my architecture in a different post. First step in using iTraveller is creating a Local set. 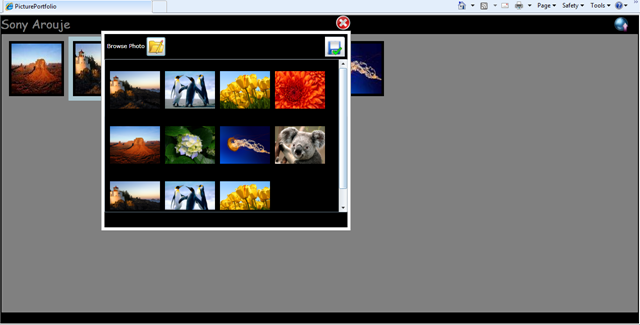 You can create a local set by dragging and dropping your photos from Windows explorer to the Local Set box at the left top pane. When you drag and drop photos to Local Set pane, it will ask whether you need to create a new set or add to an existing category. You can see the photos inside a category by clicking on category and all the photos inside the category will show in the bottom pane of the application. Humans are prone to errors, if you accidentally create any Local Set, don’t worry select the Local Category and just press delete key in your keyboard, you are done. The local set is deleted (only from iTraveller). In some scenarios you may need to delete only couple of photos from a local set. You can do that as well, select the photo from the thumbnail view and press delete key in your keyboard. You need to authorize iTraveller to connect to Flickr. Clicking on the synchronize button for the first time will popup a dialog box and follow the step to authorize it. After the authorization iTraveller will download the Flickr sets from Flickr. Now let’s see how we can upload photo(s) to Flickr. Select a Flickr set in the right hand side of the application. Click on the Flickr set you want to upload your photo. It will open a tab as shown below. Drag the required photo from the thumbnail to the Queue box and drop it. You also can give the Title and Description for the photo. By default visible to public is unchecked, if you want your photo to be visible to public then check the ‘Is Visible to Public’. You can put as many photo to queue. Once you are connected to internet, click the synchronize button just below the Flickr set to upload it to Flickr. You can upload the photo to Facebook just like the way we did for Flickr, instead of Flickr set you should select a Facebook Album on the right hand side. First time synching with Facebook needs your authorization. After you allow iTraveller to communicate with Facebook account, it will download all your Facebook Albums. iTraveller will take some time to get the photo albums from Facebook. Once the synchronization is over and iTraveller got any new comments from Facebook or Flickr then it will open an Updates tab for you, so that you wont miss any updates. 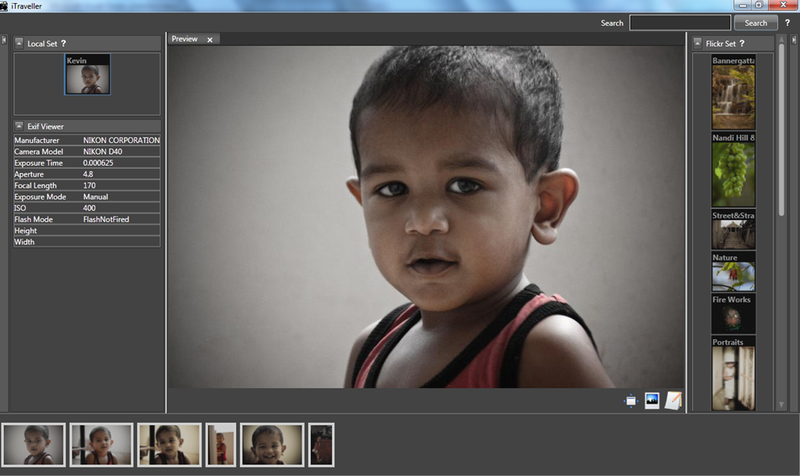 You can provide different title and description for Facebook and Flickr Photos. These text is also searchable. You can also create Flickr Set through iTraveller. Click on the ‘+’ icon, just above the Flickr Set Thumbnails. iTraveller will popup a window to enter new Flickr Set and Set description, click save once you done. 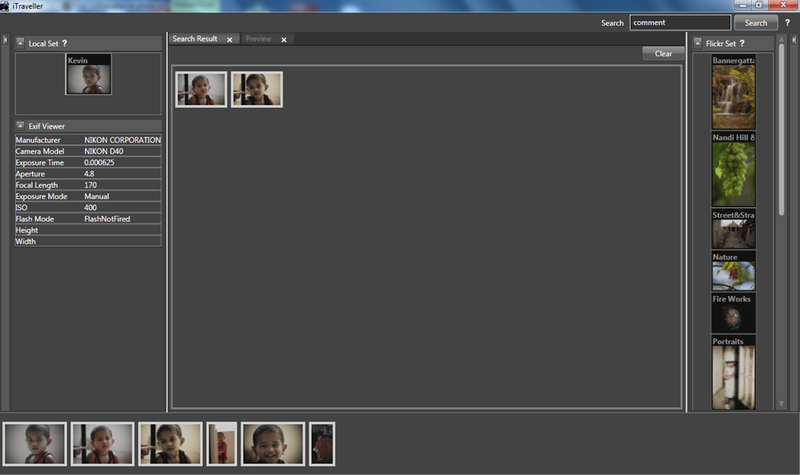 While synchronizing with Flickr, the set will get created in Flickr. To create a Flickr Set successfully, at least one photo should be their in the upload queue of the newly created Set. The thumbnail of the newly created Set will be displayed only after the synchronization. iTraveller have built in searching feature. 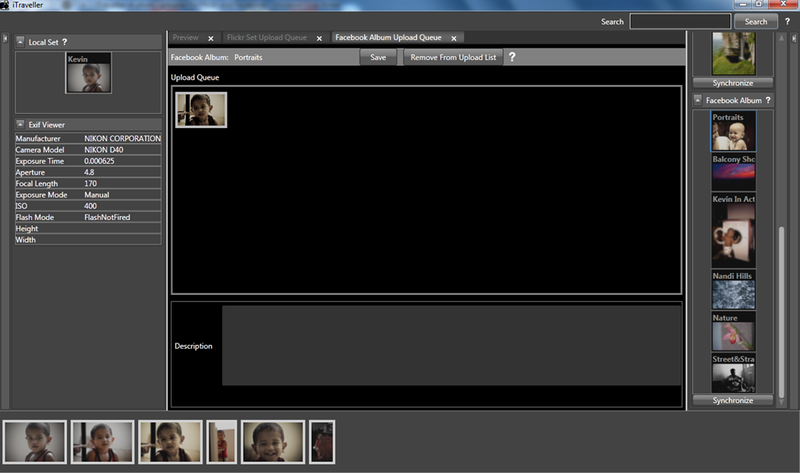 It enables the user to search for photos that satisfy the search text. The search will only look for photos added to iTraveller. User can search for the photo name, Title, Description, Flickr Title, Flickr Description, Facebook Description and Photo Comments. Enter the Search Text at the text box located at the top right corner of the application. As a photographer you will have a lot of photos in your hardisk. Always our big problem is how to find a photo with some attributes. iTraveller can help you out, you can add a title and description and just save it. When ever you want to find it just enter the search text and click search. Another reason for search is, you may wanted to find the photos that got comments from your friends (either from Facebook or Flickr), let’s say Kevin or Sony. Go ahead and enter Kevin;Sony in the search text and hit Search button. iTraveller will give you the list of photos commented by Kevin or Sony. You can see the preview of the Searched photo by double clicking on the thumbnail. 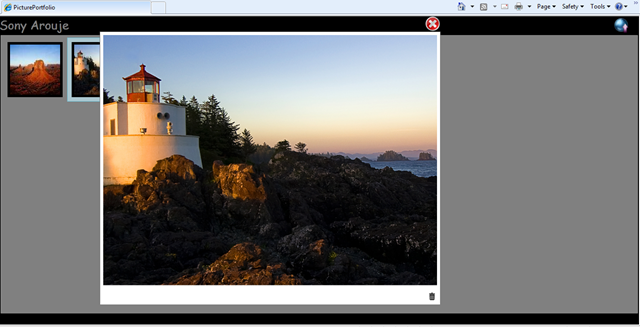 In the preview if any photo have any comments then a View comments button will shown in the preview tab as shown below. Clicking on the comments button will open a new comment tab as shown below. You can leave this tab open and the comments will get changed when you navigate from one photo to another through the thumbnail. Clicking on the button will show the photo in Full screen. The background of Full screen mode is 18% gray. View Comments button, this button will be visible only if the preview photo have any comments. By default the Local Set thumbnail is randomly picked. Any time you can change the thumbnail image of a Local set. Select the category and select the desired photo from the thumbnail. In the preview tab click on this button. Done… your Local set thumbnail is changed instantly. Note button opens a small popup and you can add a Title and Description to your photo. More feature will get added in next release, but needs motivation. Use my iTraveller and Motivate me . In coming days I will release iTraveller with bug fixes and new enhancements. If you have already installed iTraveller 2.0, then you can upgrade to latest version. Please take a backup of the following files and folders before you update to new version, it will help you keep your data safe. In case of any issue after the update like not showing your Local set or any thing, you always can put the backuped up files back to the iTraveller folder. I uploaded the application here. Install it and let me know your feed back. In this application I used Reactive Extension (Rx) to perform Async service calls. I felt the Rx is a very powerful tool to perform Async calls. The one good advantage of Rx is you can place Async calls in Thread Pool and push it to dispatcher once the call completed. All these can be done in one or two lines of code. This way the UI will always responsive. I don’t think I need to explain Caliburn Micro in detail here. I wrote a post that gives a brief introduction to Caliburn Micro. Now the Mongodb will listen to the default port and our app can make request. There are different ways of hosting Mongodb, you can get more details from Mongodb site. Below is the screen shot of my application. This page will display the thumbnails of uploaded images. We can see the bigger image by clicking on the thumbnail as show below. The preview will display in a Windowless popup. We can delete the photo by clicking the Trash icon bottom right side of the image. 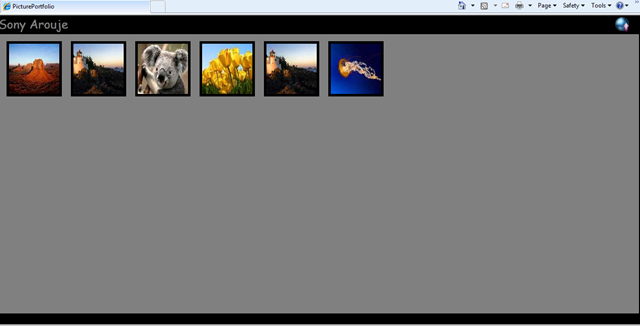 We can upload images by clicking on the upload icon at the top right of the window. The upload page will get displayed as shown below. When the user upload the image, the application will create a thumbnail version of the image and store along with the original image in the server. This helps to transfer and load the thumbnail page. Let’s see the entity used in this application. The entity class is very simple. I may need to give a brief explanation about PhotoPersistanceObject used in the entity class. The PhotoPersistanceObject is used for persisting meta data of the image like Name, description etc. You might think that why cant we save Photo object directly, yes I also thought the same way but their is some issue with Mongodb driver I used here. It’s not supporting byte array neither binary, It allows to store binary in Mongodb but throws error while retrieving. So I used a trimmed down version of Photo entity to persist the data. As I told before one of the cool feature of Reactive Extension is it’s advantage of making async calls in thread pool. Even if we place async calls in separate thread in Silverlight still it will block the UI to load if we do it in page load. Because the our thread will work in UI. We can achieve the placing calls in thread pool using Rx. See the below code. As you can see the service calls are doing in ThreadPool. Once the call is done we will change the ObserveOn to Dispatcher, other wise cross thread expection will throw. I call the GetAllThumbnails in the constructor of a ViewModel. As we are doing the call in Threadpool my UI will loaded without any delay, once the call is completed the thumbnails will start display in the listbox. I wrote a Generic repository similar to the one I wrote for EF. You can find the generic repository for EF in one of my post. Below is the Generic repository class for Mongodb. This app is in very primitive stage. you may need to do lot of refactoring to make use in real scenario. I will work on this app and upload it to codeplex some times later. Download the current source here.